Everyone needs sharp central vision to see objects clearly and be able to do common daily tasks, such as reading and driving. Macular degeneration is a disease of the eye that destroys sharp central vision, resulting in an inability to read or recognize faces — and may lead to total blindness. It is a major cause of visual impairment in adults 50 years and older, hence the term age-related macular degeneration. Although it does not affect peripheral vision, the condition can make it difficult , and most times impossible, to read or recognize faces. Macular degeneration affects the macula, the part of the eye that allows humans to see fine detail. 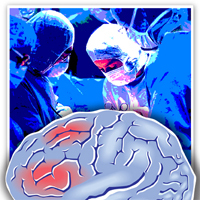 In some cases, the disease develops so slowly that people notice little change in their vision. In other cases though, it may progress fast and eventually lead to a total loss of vision in both eyes. 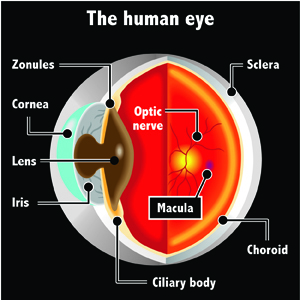 The macula is located in the centre of the retina, the light sensitive tissue at the back of the eye. The retina instantly converts light, or an image, into electrical impulses, then transmits these nerve signals to the brain for interpretation. According to the National Eye Institute, there are essentially two types of age-related macular degeneration: wet and dry. The wet type occurs when abnormal blood vessels behind the retina start to grow under the macula. Usually very fragile, these abnormal vessels often break and leak blood and fluid. With wet macular degeneration — which is also known as the the advanced type of the disease — central vision loss can occur quickly. A common symptom is when straight lines appear to be wavy. Dry macular degeneration occurs when light-sensitive cells in the macula slowly break down, slowly blurring central vision in the affected eye. As this condition gets worse, a blurred spot appears in the centre of the vision, obscuring what is supposed to be a clear and sharp image of a face or object. Over time, central vision can be lost totally. 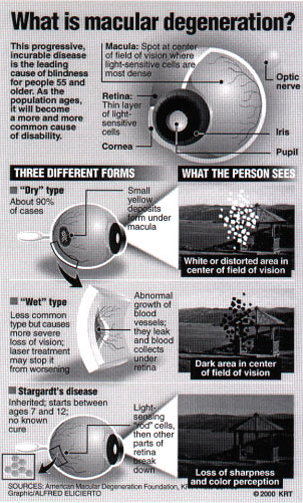 The most common symptom of dry macular degeneration is the deceptively harmless condition of slightly blurred vision. The condition then graduates to difficulty in recognizing faces and the need for more light for reading and other tasks. Graphic by Alfred Elicierto, Knight Ridder Tribune Graphics (now known as McClatchy Tribune), produced and syndicated in November 2000. It’s the best time to make plans for the long term and it’s time to be happy. I have now learned this site and, if I may, I want to suggest that you write more articles on this subject in your subsequent posts. I want to read more about topics related to this one.